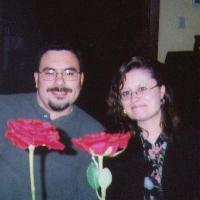 This is me with my wife, Tracey. Welcome to The Blogzone Dude! Nice pic of you and your Bride, Tracy! I will definately be adding a link to your blog on my blog. Welcome again to the major historical development. I am excited for you, bro. May all of your blogging days be filled to the bone with His life, love, & grace!